I’m back with the card of the day! For the first two weeks of October, I will be mixing up the decks and then switch back to the Halloween Oracle after that. It simply felt like the cards weren’t connecting as well, so I’m mixing it up a bit. Hope everyone enjoys their Sunday and last day of September. We are planning a stroll in a nearby memorial forest. This card definitely speaks as we see the leaves across the street float to the ground and the nights getting crisp. This card is loaded with change symbolism: snake shedding it’s skin, a skull, an egg, mouth, and dragonfly. 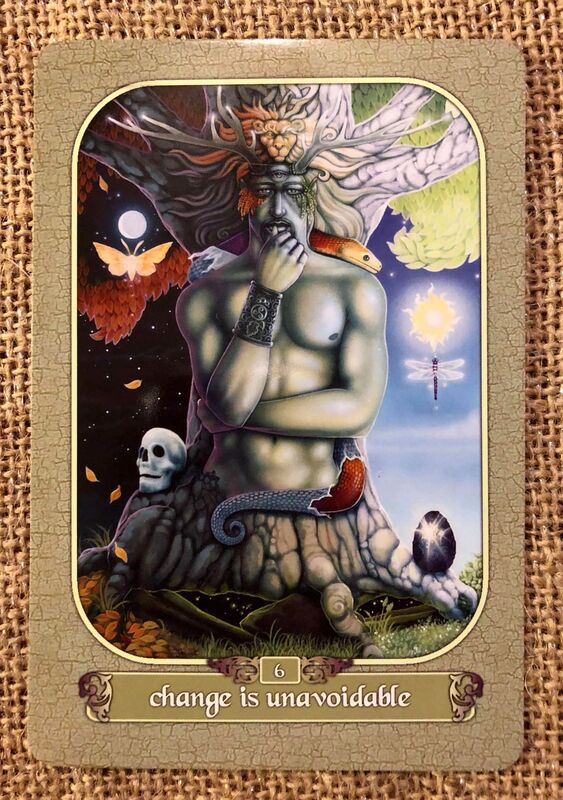 Standing grounded in the center of this change is the Horned God merged with a Dryad tree spirit. They show us not to fear or struggle against change – things are always changing and we must learn how to roll with it. Change is unavoidable – every second of every day you undergo change. Your perception is altered by what you see, feel, and experience from one moment to the next. Your body ages and moves closer to death with every breath. Autumn will always come to end of the bounty of summer, and the new hope of spring will always follow the winter. Change is all around you. Do not let your fear bind you to the past and prevent you from enjoying your present and future. Stop fighting. You cannot resist the inevitable so choose instead to embrace it with acceptance and peace.